Both open and closed cell spray foam insulation is available. Both are applied wet and expand to fill the space they are sprayed into. Open foam is sprayed wet then dries, opening into a spongy substance that is filled with air. Closed cell insulation has less air and can be a little more rigid after drying, creating a sturdier barrier. Both options are fantastic for your home or office building. You’ll save on electric costs as your home keeps cool or warm air in with ease. As mentioned, spray insulation will save you on heating and cooling costs. The foam has an ability to be applied right into small crack and nooks that other types of insulation can not reach. Once the foam dries, you’ll have the ultimate blockade from outside air entering your space. The foam will create a wall of protection that will provide better overall insulation for your home or workplace. Because of the efficient insulation, you will definitely lower your utility bills when it comes to heating and cooling costs. Studies show that foam insulation will actually save you anywhere between 35%-50% on your utility bill. Because the spray reaches all of those impossible nooks and crannies, it’s going to block out all of the potential entrances for pests and insects from entering your home. You might not even realize all of the holes that may be in your building structure. Let the foam work its magic by filling all of the holes you didn’t even know were there. Once the foam dries, it will be impossible to break through, even for the rodents who love to gnaw their way through things. Your home will be a healthier, happier place with spray foam insulation. You’ll experience fewer insects and illnesses from rodents in your home. Foam insulation will reduce the condensation in a space, resulting in lower amounts of mold and mildew. Preventing water from entering your building will help block standing water and moisture, both which aid mold and mildew in their growth. Eliminating mold and mildew is important for the health of your family or your employees. The health issues that arise from exposure to mold and mildew are many. With closed cell insulation, your home can actually become a sturdier structure. As your walls and beams bear the weight of your home, spray insulation adheres to the exterior sheathing and the studs of your home for optimal stability. The closed cell spray will harden and make your building less likely to shake by helping it withstand high winds and other adverse weather conditions. Additional structural strength elements like this can actually add value to your home. Fiberglass and Styrofoam insulation options sag and bunch over time. Often, insulation of this sort has to be replaced periodically to help your home stay insulated. These insulations can even crack and break with age. Spray foam insulation will never sag or bunch, and it also won’t break down. Spray foam insulation will last much longer than the other options. You’ll save from not having to replace it as your utility bill continues to stay low. Yes, believe it or not, spray insulation can actually help your allergies. As the spray blocks the small spaces in your foundation, it will prevent air filled with allergens from entering your home. Reducing the number of allergens entering your home or business will benefit those with allergy or respiratory conditions, which in turn might lower your health care costs. Spray foam is a great noise reducer. The open spray will minimize noise levels in your home or office. The open cell insulation is more effective at reducing noise than is the closed cell, but both do wonders to keeping your home a quiet, peaceful place. 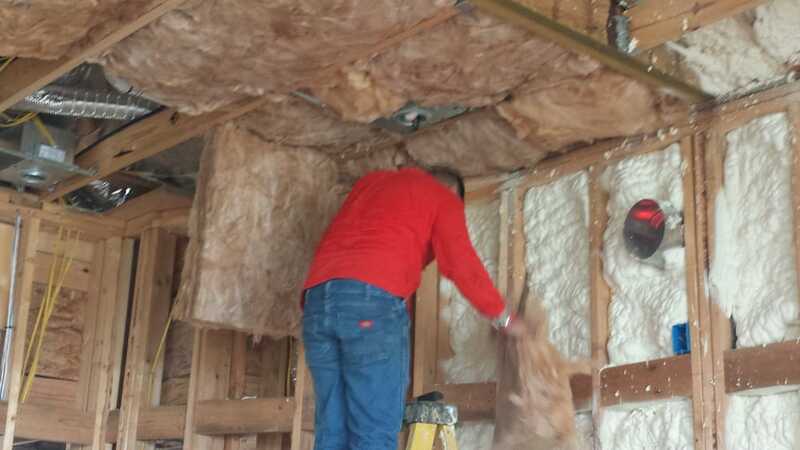 Fiberglass insulation installation is a messy, itchy, sharp process. The process for spray insulation is much neater, cleaner, and less of a hassle. The spray will come in canisters attached to a spray hose. With spray insulation, you won’t have to worry about dealing with the mass amounts of fiberglass that may get on your skin or floor. The spray will come out through a controlled hose and go only to the designated areas. The spray will dry in place, and you’ll never have to touch the insulation. The main ingredients in spray foam insulation are isocyanates, which are chemical compounds that should be handled carefully. Not only could they irritate your eyes, lungs, and stomach, contact with the foam can cause serious rashes and other skin problems. Whether you’re applying it yourself or you’ll be around as other people do the job for you, wear protective clothing. Use goggles, gloves, and always wear a mask to avoid inhaling the chemicals. Your best bet is to leave the application process to the professionals. 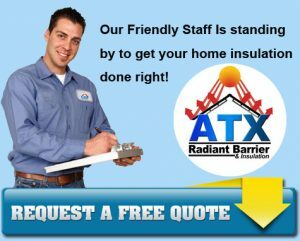 We’re skilled in the process and have more than 10 years of experience providing spray insulation solutions for clients around the Austin, TX area. When you’re ready for the ultimate insulation and installation by the pros, contact us today!